﻿ Grand Sea Hotel, Da Nang | FROM $38 - SAVE ON AGODA! "This is a nice friendly hotel that suited all my needs." Have a question for Grand Sea Hotel? "Location to the beach in 5 min walking distance." "We loved our stay at the hotel." 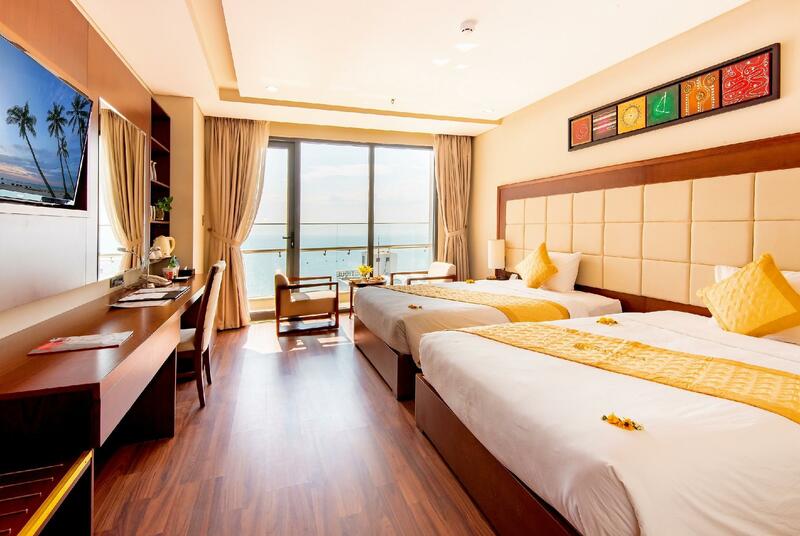 Ideal for fun and relaxation, Grand Sea Hotel is located in the Phuoc My area of Da Nang. From here, guests can enjoy easy access to all that the lively city has to offer. With its convenient location, the hotel offers easy access to the city's must-see destinations. 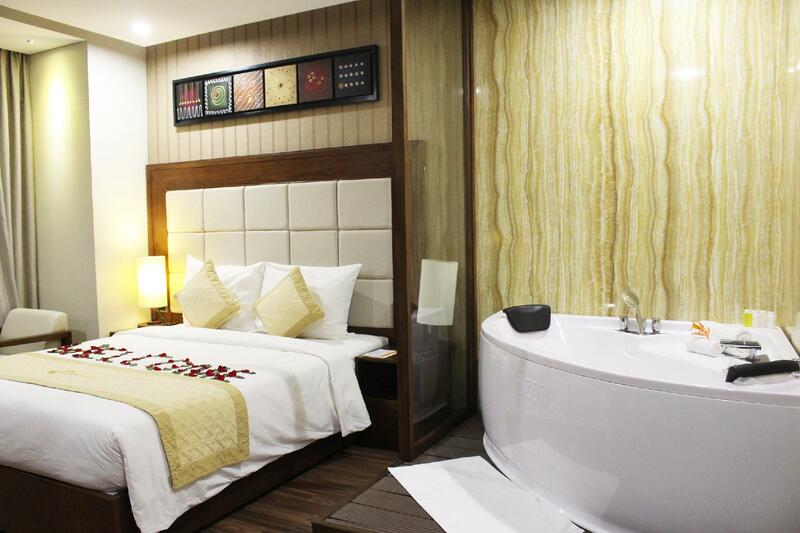 The facilities and services provided by Grand Sea Hotel ensure a pleasant stay for guests. 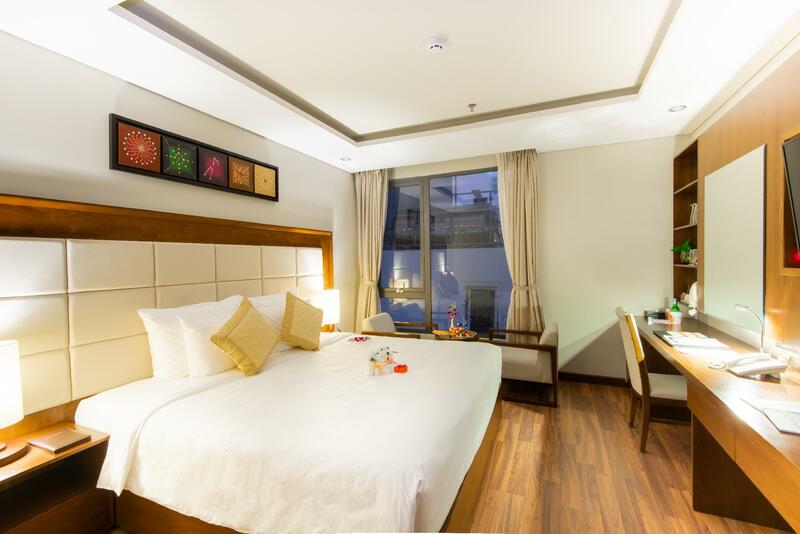 24-hour room service, free Wi-Fi in all rooms, 24-hour security, daily housekeeping, fireplace are just a few of the facilities that set Grand Sea Hotel apart from other hotels in the city. In addition, all guestrooms feature a variety of comforts. Many rooms even provide television LCD/plasma screen, carpeting, clothes rack, complimentary instant coffee, complimentary tea to please the most discerning guest. The complete list of recreational facilities is available at the hotel, including hot tub, fitness center, indoor pool, massage, steamroom. 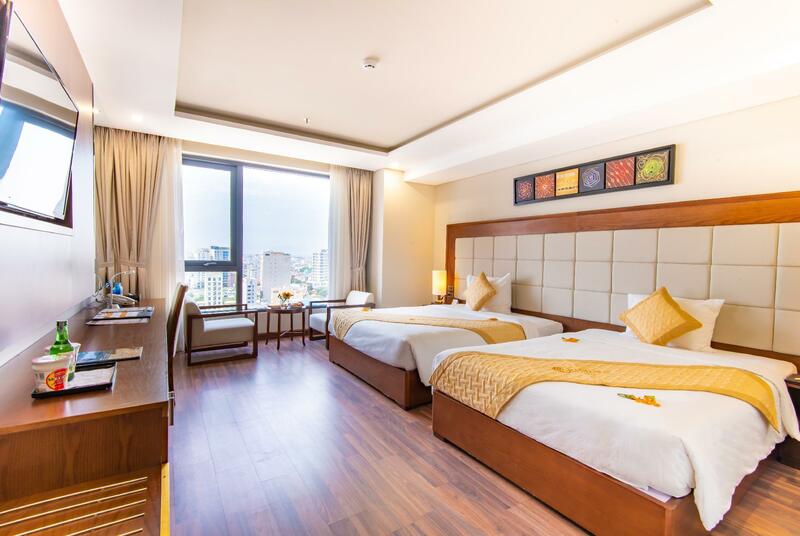 Grand Sea Hotel is an ideal place of stay for travelers seeking charm, comfort and convenience in Da Nang. 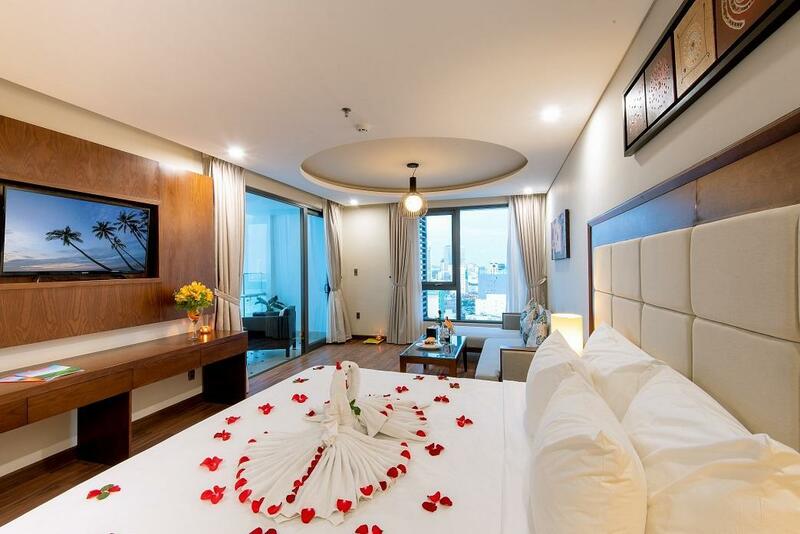 "Friendly staff, clean room, nice breakfast"
this is the best hotel room i stayed in da nang. i loved it so much. great breakfast, great big room, very comfortable, clean. I super duper loving it. even thought only partial sea view. 10/10. should not be 4 stars..its 5 star. I have traveled to Vietnam several times and not felt that welcomed but decided to visit Da Nang and stay at the Grand Sea Hotel and were just blown away from the moment we landed at how clean, new, modern and friendly everything was. We arrived at the Hotel and once again were just blown away at the friendliness and helpfulness of the staff. We were welcomed with a cold cloth and tea and quick check in. We met the Customer Service manager who became a friend during our stay. She was very helpful and went out of her way to help us talk with locals and find things. Later she even escorted us to a local market to show us the way. The room was AMAZING, it was on a high floor with a Large balcony beach view on one side and a city view on the other. The room was like new clean and well appointed with a large couch, King size bed, large bathroom with tub, large TV, Great AC, fruit basket, perfect. We will Definitely go again and again. Thank you for your kindness during our stay. We'll abslolutely recommend this hotel to our friend. We had an unforgetable honey moon in your hotel. We thank for your beautiful preparation and decor our room. Staff from front desk to housekeeping to everyone were very nice and professional. Room was spacious and new. Location is excellent. though it's not beach front, but less than 5 minutes walk to the beach. many restaurants, bar and convenient stores were all a couple minutes walk from the hotel. Value for the money can't be match for this hotel. I've stayed at many 4-5 star hotel in Da Nang and this is the best one so far. Will definitely come back. Food around the hotel are at reasonable price. There is one local seafood restaurant that must try if you there. The hotel is one street back from the beach. It isn't a resort. It is very comfortable. Room size, furnishings, all good. Breakfast was awesome. Staff were friendly, helpful and pleasant. It was all 4* plus standard. Tips: This area has more things going on while the opposite end has more constructions. It is located right behind Ala Carte Hotel. Hotel is short walking distance to the beach, convenience stores, street food stalls selling local foods and fresh fruits. There are many nice restaurants nearby such as Tokyo BBQ, Bé Anh Seafood, nice Vietnamese restaurants around the block. Hotel staff were friendly and helpful. Breakfast buffet was good with fresh fruits, local Vietnamese food as well as international options. Daily housekeeping was excellent. Hotel provided extra towels, bottles water and pillows for my family. Beds were comfortable. Nice beach view from my balcony (City Deluxe Twin Bedroom). The only thing is the hotel has an indoor pool so the water is cold (a heated pool would be nice). We spent most of our time on the beach so it's not a problem. Good location near the beach, staffs are friendly, some don't speak English, some speak English very well, and they are very friendly and helpful. My wife left her mobile phone in Uber. One of the staff help us to call and communicate with the driver and got the mobile phone back. Room is very nice, spacious, and clean. Swimming pool is small but not an issue for us. I would highly recommend this hotel. This hotel is on a back street with major construction in front of the hotel. Please is OK and only 100m to the beach. The pool is small, in the open and COLD, at least in April 17. Rooms are big and clean. I got early booking price which is about 1 million VND for one double room with sea view and it was great. The room is clean, furniture is new, staff is helpful, breakfast menu changes everyday and has some great choice of fresh juice! Because it is close to the beach, it is quite far from downtown so we had to take taxis everytime we want to eat something. But Danang is quite small so it's ok. Overall a very nice trip. I would recommend a sea view room. Some hotels are popping up in front of this hotel so Im not sure how long the sea view can last. Make sure you book a room on the higher floors! Good location near the beach. Good view of the sea from the balcony in our room. Staff friendly and helpful. Room spotlessly clean. Soundproofing of room not that good as we can hear noise outside. There are just too many constructions going on here in this area and going to be quite a while. We like to keep things simple and are fairly low-maintenance guests. We’ve stayed here before as Da Nang is a short flight for us. Grand Sea suits our needs perfectly — staff are always very obliging and spoil the kids, it’s two minutes from a fabulous beach and taxis into the centre of town are cheap and always waiting outside the entrance. I very much expect we’ll return next year. Great hotel on affordable price.friendly staff and the concierge the most welcoming and helpful.cleanliness is superb and the buffet breakfast with good choices of asian,local and western.Location to the beach in 5 min walking distance..located along ha bong street where you can find some good food outlet ,seafood restaurant abundant and mini mart.At nite set up stalls along the road. We stayed 4 nights in the Family deluxe. worth for every cent. Room is really large with Great view to both city and part of beach. The hotel is in great location-150m access to the beach, nearby street food and convenience stores. Especially, we can buy lots of cheap and fresh fruits for daily use. My wife was really satisfactory with the room, bundle prepared for my 10-month kid. Staffs are helpful and friendly. Breakfast was good but not lots of options. I will come back next time. Excellent room, very close to the beach, `very friendly staff. The breakfast was okay, but the coffee was horrendously bad.